In my last post, I talked about using the time in summer for working toward my musical theater goals. One of those goals is updating my headshot. Every day we change, if only a little, and the subtle differences begin to grow more obvious the older our headshots become. It's been only six months since I had my headshots taken, and from looking in the mirror, I'm due again. If it’s been more than a year since you’ve posed, you are more than likely due too. 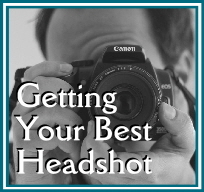 If you are new to the idea of taking headshots, and for those of us who need an update, I have pulled together some tips to help assure your photo session be the best it can possibly be. You shouldn’t just hire anyone out there with a camera, you need a professional—someone who can make you look and feel the best you can be. After all, your headshot is the representation of you all the casting directors will use when making decisions about who they want in their show. First things first, you need to find a photographer. If you have a good one, you’re already off to a good start. Finding the right photographer in your area might take a little work. Start by gathering a list from friends, or do a little research and find out who shot your favorite professional actor’s headshot. Who knows, maybe they are close to where you live, and are available for a shoot. One thing to keep in mind if your starting off as a kid/teen in the musical theater world, headshots are an important business tool, and the photographer who took your beautiful family photos may or may not know what the musical theater world is wanting. Next, talk with them over the phone and if you like who is on the other end, schedule an appointment to meet up. A tip I learned at a recent master class with agent Anthony Boyer is to be sure the photographer is someone who gives you a positive energy and is easy to work with. Make sure you feel comfortable with who’s behind the camera. He also mentioned it’s important to check with them to be certain they specialize in musical theatre shots. Ask to see samples of their work and be sure they have sufficient shots to view, not one or two examples. It’s important to do your due diligence at this stage. Headshots can be costly and you want to be sure you’ve done your research! Once you’ve decided on who you would like to use, schedule your session on a day when you have some downtime. A relaxed you will make for better photos, which is a great reason why I think summertime makes sense! When you schedule your session ask the photographer for advice how to prepare—be sure to do this in advance. Some questions you might want to ask are: What should I wear? How should I do my hair? Are makeup and jewelry recommended? Remember, you are the one paying to have the shots taken, so don’t be shy, ask as many questions as you need answered. Typically, unless you are taking character headshots, most photographers advise a natural look; hair that is styled neatly but not stiff, usually down or brushed back; clothing should be a color that compliments you, nothing flashy or gaudy with words or complex patterns; jewelry is generally kept at a minimum, as not to distract the attention away from the face; depending upon your age, light makeup may be worn, but keep in mind, it’s not usually considered appropriate for children. Some photographers may ask you to choose a background—be careful of choosing anything that will take the attention away from you. On the day of the photo shoot, be sure you are well-rested, wide-awake and ready. The last thing you want is to be stressed, groggy, or in a bad mood with giant circles under your eyes in your marketing photo. To avoid stress the morning of the shoot, gather all the materials you will need and directions to the shoot location and have them ready the day before your session. On the day of, eat something healthy, grab your bag and directions and head out with a positive attitude. Remember, your headshot is the representation of you, make it a good one. During the photo session, be sure to give a true smile. If you are struggling with this, or lacking confidence or feel nervous, try thinking of something funny, something that makes you happy, picture something peaceful like the beach, or imagine playing with a pet or hanging out with a friend. It might sound silly, but it can really help a lot. And most importantly, remember to breathe! Before you know it, it will all be over and you will be choosing the shots you like best. -A kid who likes to shimmer, shine, sparkle, and glimmer!